You may not have even known that there is a wholesale supplier whose dedicated to distributing quality travertine soap shelves in the South Florida area. If that’s the case, you’re probably paying more than you need to for your current supply of travertine soap shelves. 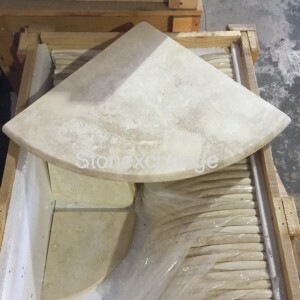 Stonexchange, a natural stone distributor of soap shelves and seats is based in Miami, Florida, and distributing quality travertine soap shelves at a discount price is our specialty. Also referred to as a shower caddy, our travertine soap shelves are cut from our own quarry in Turkey where the finest natural tiles are mined. Like every natural stone, travertine is porous. However, it’s more porous than the popular marble stone. Because of travertine’s increased porosity, the surface of this stone is noticeably affected—in a good way of course, especially if you’re installing this material in a damp area like the bathroom, kitchen, mudroom or laundry room. Here’s why: Unlike marble stone, travertine doesn’t have a slippery surface. It’s porosity offers a more textured feel, which is perfect for swimming pool areas. Travertine is the preferred choice among builders for such spaces because it not only looks good, it’s actually practical! For wet areas, travertine has come to replace porcelain in some instances. Of course, this depends on what the buyers may prefer and what kind of look they’re trying to achieve. When it comes to selecting the perfect finishing, travertine tile is one of the top choices. Even if it isn’t for wet rooms, the textured look offers a more rustic old-world charm for designers who are looking for such a look. Some grades of travertine will look a bit more weathered. This could affect the overall cost. The less expensive grade does not mean the one is cheaper than the other. It’s simply a matter of which grade is the most popular, because in the end, it all comes down to business—supply and demand! The Ivory Travertine has notes of light beige, cream, and brown movements within its pattern. It’s typically installed in lighter-colored-themed shower stalls. All of these colors produce a fairly neutral presentation that can complement many other styles of travertine tile or even other types of natural stone depending on the design you’re going for. For spaces with a darker tone, the Walnut Travertine soap shelf is going to be the better choice. With its dark brown, beige and cream tones, the overall surface appearance is primarily brown. So even if you installed Ivory Travertine in your shower stall and you want to create an interesting contrast, then consider going a shade darker to highlight your natural stone shower caddy. It also pairs well with other kinds of natural stone that share the same color tones. All of our travertine soap shelves come in a 9” radius. This is the standard size we have in stock. If you need a larger size, we also stock 18” travertine shower seats. Any other size will need to be manufactured at our quarry. We also provide edge profiling and bullnose to smooth the edges for safety purposes. Stonexchange can edge your soap shelves out to have a slight incline where enough water is able to drain from the shelf while keeping your toiletries standing upright. While our travertine soap shelves are shipped in from overseas, this part of the manufacturing process is conducted domestically. Soap shelves are typically installed in tubs and shower stalls, but they can be utilized for many different creative purposes. Use these as built-in shelves for the kitchen, home office, man cave, wet bar, etc. These beautiful slabs of art can also be use as just that—art! With the right interior designer, you can create an attractive feature wall that could be the focal point of your room. Use the angles artistically to frame a fireplace or large window. It’s all about thinking outside of the box and having the courage to step out to do something creatively innovative. If that’s too much for you, then let’s just go back to using these shelves to cradle your shampoo, body wash, and razors. Tell your buyers that they can do away with those plastic and wire shower caddies that collect soap scum and rust. Stonexchange’s travertine shower caddies porosity allows for a relatively splashless surface that won’t usher your toiletries onto the shower floor. Its textured surface allows for just enough traction to keep everything from a loofa sponge to disposable razors in place. Through Stonexchange, you will get your travertine soap shelves at the best price in the industry. We can afford to offer you discount pricing at wholesale prices because there is no middleman involved who needs to increase the unit price. Your supply of travertine soap shelves comes straight from the quarry and directly to your warehouse and/or construction site. The more stone soap shelves you purchase, the more likely of you getting the lowest price per unit will be. Take a look at our selection of travertine soap shelves in both ivory and walnut colors here. Stonexchange also specializes in supplying natural stone window sills and thresholds in marble as well. These are the type of building materials that many contractors may be paying too much money for because they overlooked Stonexchange! Get your travertine soap shelves directly from the source! Call and speak to one of our representatives today to learn more about our products at 305-731-2400. You can even contact us online!